Kia has revealed its newly revised Rio and Venga models at the 2014 Paris Motor Show. Both are scheduled to go on sale in the UK from early 2015, with no major price changes expected. 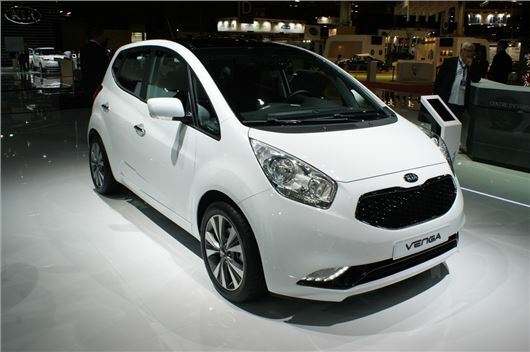 The Venga currently costs from £10,195 and the Rio from £9495. The Venga gets changes to its styling, with a larger grille and new lights, plus restyled bumpers. This brings it more into line with other Kia models. The cabin has been subtly updated too, with a new centre stack layout and some extra optional equipment, including the latest version of Kia’s infotainment system and a heated steering wheel. The Rio isn's as different but gets redesigned bumpers and new alloy wheel designs, plus new exterior paint options – Digital Blue and Urban Yellow. Like the Venga, the Rio benefits from a restyled centre console with the latest infotainment system. DAB radio is now standard on all Rio models. Both the Venga and Rio will be available in the UK from early 2015.